Restaurant style Pasta Arabiata is really quite simple if you pay attention to the details. All it takes is good quality pasta, plenty of ripe tomatoes and a little time. You’ll never turn to those ready-to-eat gummy, over-seasoned “Paste-a” once you’ve had this home-made pasta. This home-made Pasta Arabiata is the real thing. Perfectly cooked pasta tossed in freshly made tomato sauce, golden brown mushrooms and tender braised chicken topped with grated parmesan. The dish is even more luscious than the description makes it sound. It is a complete meal in itself but you could serve it alongside crisp garlic bread, a little bit of crunch to cut all the cheesy goodness. This pasta is a wonderfully kid-pleaser too. 1. Cook Pasta till al dente (firm, but not totally soft). To do this, in a large kadai or pan bring around 5 cups of salted water to a boil. Then drop in the pasta and let cook. Use a fork to test doneness or bite into a piece to check. Once done, drain the water and toss the pasta in 1-2 tsp of oil. Set aside. 2. To blanch the tomatoes, in a broad pan bring water to a boil. Drop in the tomatoes. Switch off after 3-5 minutes. Transfer the tomatoes to a bowl containing cold or room temperature water. When the tomatoes have cooled enough to handle by hand, peel away the skin, halve them, remove the seeds and then chop roughly. 3. In a medium pan, heat 1 tsp of oil and drop in the mushrooms and sauté for 3-4 minutes till the mushrooms start browning. When the mushrooms have browned nicely, remove from pan and set aside. In the same pan add 1 tsp of oil and sauté the chicken pieces for 1-2 minutes. Then add water (just enough to cover the chicken) and salt, cover and cook on low for 10 minutes or till the chicken is cooked through. Drain the water, set the chicken pieces aside and save the braised liquid for the sauce. 4. In a pan, heat 1 tsp oil and add the finely chopped garlic and white onions. Fry for 1-2 minutes till the onions are translucent. Then add the blanched, chopped tomatoes along with the drained braising liquid and 1-2 cups of water (adjust) and stir well. Let cook till the tomatoes are mushy and it has reduced to a sauce consistency. Add in the braised chicken and sautéed mushrooms and stir around. Season with salt, black pepper powder, oregano and basil. Mix well and simmer for a minute for the flavours to blend. 5. Add the cooked pasta to the sauce and toss well. Top with grated cheese and mix gently. Switch off. Serve hot. To make a vegetarian version, just omit the chicken and increase the amount of mushrooms. Or add in vegetables of your choice – baby corn maybe. 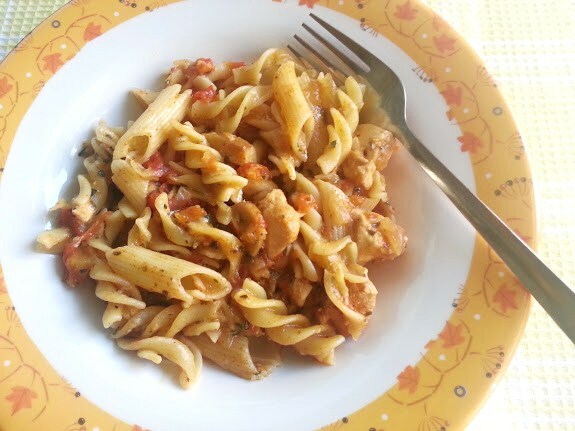 This entry was posted in Chicken, Fish & Meat, Pasta & Noodles and tagged italian cuisine, non-vegetarian, Pasta arabiata with braised chicken and mushroom, pasta in tomato sauce, pasta with chichen and mushroom, recipe, restaurant style pasta, rice.